1. The machine can be used for single or continuous punching of shoe eyes, upper buckle, lower buckle and punching hole (single or double side can be freely chosen). 2.According to the requirements of the working object, the distance between the holes of the two eyes can be adjusted at will. 3. The riveted squint eye is meticulous, beautiful, neat and immutable. 4. Simple operation, safe and reliable performance. 5.The efficiency is 8-15 times of manual operation. 6 the new upper tray is convenient to replace the buttons when operating, and place the buttons in the tray. It's more convenient to replace. 7, under the tray can be waste, debris placed in the tray. So as to reduce the pollution of the production environment, green environmental protection. 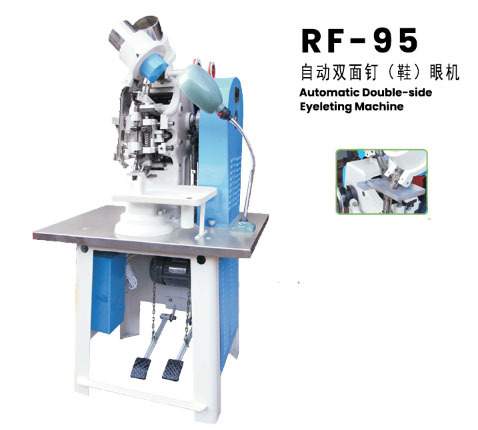 This machine is suitable for punching shoes, leather goods, paper bags, clothing and other metal double-faced shoes.